I had the best partner for my very first blog swap! 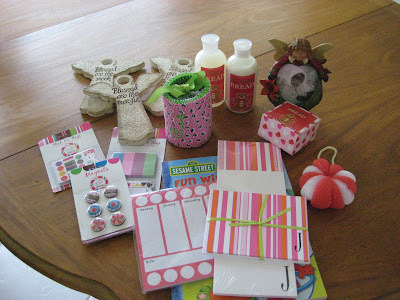 It was a Christmas in July swap hosted by Molly Lou Gifts and my parter was Jen & Rob. Let me tell you, it was definately Christmas! The box was jam-packed with gifts and they just kept coming out of the box, I didn't know where it was going to end! 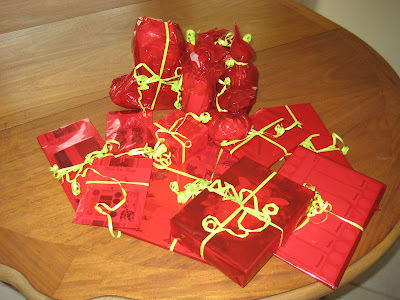 Then it took me forever to open everything, it was so exciting! Now, what was inside? Lot's of great stuff! 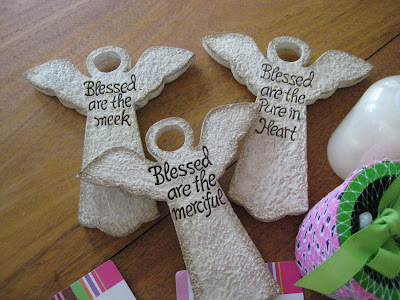 - Three ceramic angels with the Beatitudes. I just love these, I think they are my favorite. I think I'm going to hang them above the door in Baby Girl's room with some pretty pink ribbon! 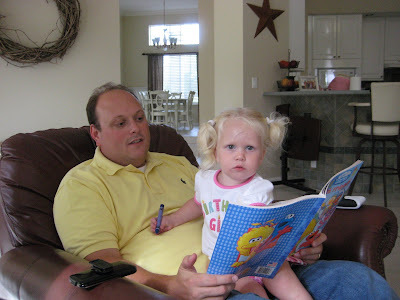 Here's a picture of Baby Girl enjoying her new Elmo and Seseme Street coloring book. She loved it! Now, I only hope that Jen loves my gift to her as much as I loved mine. Thanks Jen and thanks Molly Lou for hosting! I love these swaps. How fun. You sure did get the goods!! Yay! I'm so excited you loved everthing!